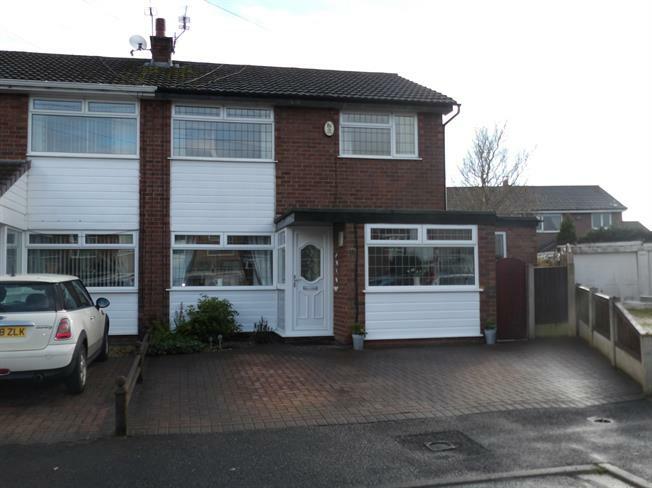 3 Bedroom Semi Detached House For Sale in Leigh for Offers Over £180,000. OPEN HOUSE EVENT 27TH & 28TH APRIL PLEASE CALL THE OFFICE ON 01942 670011 TO BOOK YOUR VIEWING SLOT This well presented property has been upgraded by the current owners to offer a wealth of style and design with contemporary living. On entrance you will find the enclosed porch with access to the lounge/diner. Family kitchen/diner with a range of high gloss units and integrated appliances. The garage has been converted to offer a second reception room. There are three good size bedrooms with two benefiting from fitted wardrobes. Four piece bathroom suite. Driveway and enclosed garden to the rear. Enclosed porch with access into the lounge. A light and airy lounge/diner with patio doors to the rear garden. Feature fireplace with living flame gas fire set within. Wooden flooring. This bright contemporary style kitchen/diner has 3 double glazed windows and has been fitted with a range of high gloss wall and base units with complementary work surfaces over. Fitted with integrated appliances comprising of fridge, freezer and dishwasher. Access to the garage conversion used as a second sitting room. Stairs to the first floor. This garage conversion offers versatile living space and could be used as a multitude of things. Fitted with a four piece suite comprising walk in tiled shower cubicle, panel bath, pedestal wash hand basin and low level W.C. Complimentary tiling.